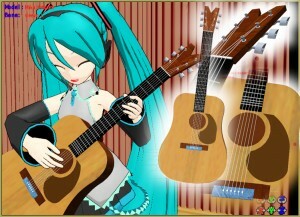 Download Reggie Dentmore’s MikuMikuDance Folk Guitar! You can download Reggie Dentmore’s MMD Folk Guitar Accessory that was created for use in his ongoing “Dueling Banjos” project. After a search of Google Sketchup’s 3D-Warehouse, I chose the Guitar uploaded by JJY. You can find it there, for yourself, search for JJY or Acoustic Guitar. In Sketchup I modified JJY’s guitar model by resizing it to match MMD’s scale and I recolored the guitar to better translate into a nice looking DirectX model. I then used the 3D-RAD Plugin to export the model as a DirectX file for MikuMikuDance. I was lucky in that the guitar strings came along with the new DirectX model. Many times the “strings” are just simple lines on the Sketchup model and so do not translate into anything. The Banjo I created required that I actually add the strings as 3D objects. More on that, later! See my articles about creating MMD Accessories using Google Sketchup and the 3D-RAD plugin. Also check out my “Dueling Banjos” project’s progress. Click the link, above, or visit the LearnMMD.com Downloads Page to get your copy of my Folk Guitar. Attach it to a dummy bone and you will be ready to strum! LearnMMD's Dueling Banjos Banjo is avilable for Download! I love your guitar, Reggie! Just what I needed for my ODDS&ENDS video! WOOT!